Editor’s Note: This is a very in-depth and comprehensive review of the film, meaning there is a big spoiler warning (read at your own discretion). Enjoy the review! 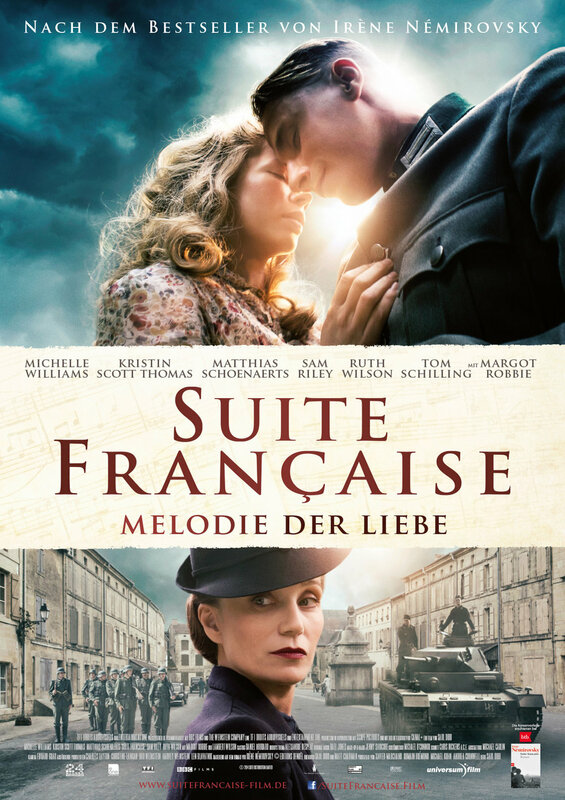 While searching Netflix for a good movie to watch, I came across an interesting title, “Suite Francaise”. Already enjoying romance/drama and historical films based on World War I and II, the movie intrigued me. However, reading the description, the movie sounded like an unoriginal plot with a predictable ending. Much to my surprise, this film takes pleasure in changing expectations for a historical fiction drama. 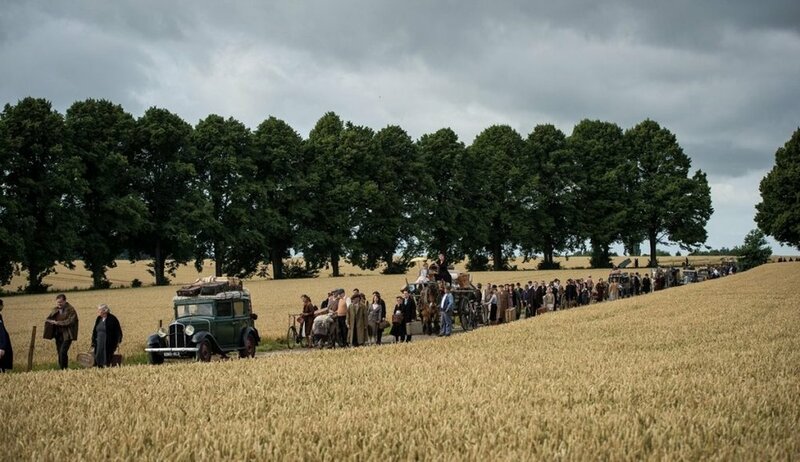 With a dramatic start, the movie is said to take place in Bussy, a small town in France. During 1940, the start of World War II, the town is turned upside down when the Nazis occupy. Right off the bat, I noticed how beautifully filmed this adaptation is. I feel a musical frisson every time I listen to the ticking watch on top of the soft piano. I not only get the chills when listening, but when watching, it seems so clear and lucid. It appears as if there was no screen in between myself and the characters, and I was actually seeing and experiencing the movie. I’m guessing this is due to how many different shots and angles were used with an amazingly focused camera. The camera is so concentrated, I could see the casts’ pores on their fair faces. The supporting cast includes Kristin Scott Thomas as Madame Angellier, whose icy attitude hides an abundance of anxiety and grief. Madame Angellier is horrified when an officer from the invading army becomes billeted to her home. On top of that, her lonely and depressed daughter-in-law, Lucile (Michelle Williams), desperately awaits for her husband to return after being a prisoner of war. Compared to the gossiping villagers, the handsome German officer, Bruno Von Falk (Matthias Schoenaerts) delivers as a concerningly charming house guest while playing elegant melodies on Lucille’s piano. Both are sad from being alone for so long, a relationship sparks between them, but they can never express their feelings with Madame Angellier watching every move. The sweethearts possess a very complex connection since both lust for one another, however, there will always be a wall separating them. They were meant to be enemies, yet they try and create a relationship. Their forbidden love continues for three months while facing numerous problems with other villagers, cruel German soldiers, and death upon innocent people. Lucille is asked to seek help by Benoit Laborie (Sam Riley) and a second time by the Viscountess (Harriet Walter). She asks Bruno to help her and her community multiple times. Bruno risks his position as a German officer, other officers, and his life for Lucille because he truly loves her. This shows how much compassion Bruno has for everyone, even if they’re on the opposing side. With an anxious end approaching, Lucile ends up rescuing Benoit, who murdered another German officer. This was her way of supporting the French and returning to reality. To drive Benoit to France, she asks Bruno for a driving pass. When they meet, emotional lines are exchanged, and Bruno promises to see her again. This scene touched my heart greatly and definitely made the tears flow. After expressing their true affections for the first (and last) time, Bruno gets her a pass, but does not write it; another officer does. It turns out the officer said to “Check the car for anything suspicious,” in the letter. Lucille drives to Paris with the letter and stops at the first checkpoint. Not knowing what’s inside, she confidently hands the letter to the German soldier. Shortly after, Benoit eventually protects Lucille by shooting the soldier. Consequently, he too gets shot in the hand, and they’re left to their own devices. Then, in the distance, there is Bruno anxiously riding to help Lucille again. During this dramatic scene, the tinkling melody of Bruno’s piece played on the piano increases the suspense second by second. I felt my heart drop when Bruno forgets that she lied to him and insists on aiding her with Benoit. Lucille rushes to close the car trunk and leans her head on Bruno’s shoulder. When trying to get in the car, Bruno brushes his hands around her trying to say something, but it’s too late. Lucille takes one last look at him whilst in ears and drives off. On top of the depressing piano, Lucille’s heavy voice narrates what she feels. What provoked me the most during this scene is how they didn’t say anything to each other! My theory is they didn’t hope for this to be a goodbye and thought they were going to see each other again. When reflecting, I remembered what Benoit’s wife, Madeline stated, “If you want to see what people are truly made of, you start a war.” This statement is correct, and is shown how during the movie, seeing that war changes everything and everyone. This includes Madame Angellier, who didn’t deny Lucille saving Benoit and saved a Jewish girl from her tragic fate. I believe the purpose of this film is to show that even though dark, horrid times, love, empathy, and warmth can be shown. “Over time I tried to forget the people I lost, but the music always carries me back… to him,” sadly expressed by Lucille. I felt distraught after watching this film, to the point where I was sobbing. I was astonished to see how emotionally captivating this movie is, an I’m still wondering why no one is talking about it. With some more research on the film, I realized it was an unfinished series, and the director, Saul Dibb, had recreated the touching film. Irene Nemirovsky’s epic novels were unfinished because she was murdered in Auschwitz, being a victim of the Holocaust. The books were hidden for over 50 years, then found and published in 2004. However, the movie greatly displays the French life under the Nazis. Even if it was complex and dramatic, I still loved the movie. I feel it shows that war changes people, and demands everyone make a sacrifice. For a handsome adaptation, I would gladly rate this movie an 8.5.